This year, September 13th marks the most auspicious day in Maharashtra, more so in Pune. Celebrated with a grandeur befitting the God of Gods, the preparations for Lord Ganesha’s birth day begin weeks before the event itself unfolds. The youngest son of Lord Shiva and Goddess Parvati, Lord Ganesha is the ‘remover of obstacles’, known for his wisdom and intellect and recognizable by his charming elephant head. Popular folklore claims that Parvati breathed life into turmeric paste to create Ganesha, her loyal son. When Lord Shiva returned to find a strange boy guarding Parvati’s bath, refusing to let him enter, he severed Ganesha’s head in a fury. On discovering who Ganesha was, Lord Shiva approached Lord Brahma to bring him back to life. Unable to join the child’s severed head to his body, Brahma gave him the remarkable elephant head. The revolutionary Bal Gangadhar Tilak is known to have revived the public celebration of Vinayak chaturthi to protest colonial rule and the curfew imposed by the British. Potters and artists gather weeks before, from across the country in various parts of the Konkan region to painstakingly make statues of Lord Ganesha. Most rituals are centred around selecting the perfect Ganesh idol, which is then adorned with flowers and Kumkum, and lovingly worshiped in family homes for the festival period. On the 10th day- Lord Ganesha’s birthday, crowds of worshipers flock across the Konkan coast, delivering the God into the water. Vinayak Chaturthi is a day of vibrance, laughter and confidence in the face of challenges. During this period, Maharashtra- home to Lord Ganesha’s glorious temples- reminisces the flair of a rainbow palette with rows of shops strewn around temple streets. They exhibit marigold garlands, selling fruit and flowers to women and men wrapped in bright, festive clothes. Travellers and worshipers can also offer Lord Ganesha some of Maharashtra’s special foods, from sweets like motichoor ladoos and Shrikhand to Coconut rice and rava Pongal. To truly appreciate Ganesh Chaturthi celebrations, its important to go back to Pune- the place where it truly began. The easiest way to get to Pune is to rent a cab and drive down from Mumbai as the road connectivity is superb. 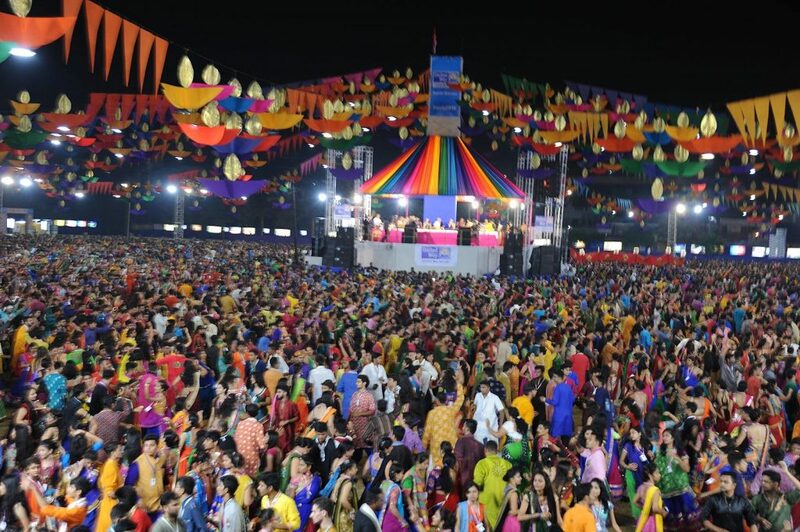 The grand, public celebration of the festival were known to have begun in Pune, which is blessed with the 5 manache; i.e. ; Ganesha idols preserved in the city’s various temples. For those wanting to explore Vinayak Chaturthi celebrations immersed in urban luxuries, the sprawling city of Pune is ideal. Kasba Ganapati, nestled in Kasba Peth, is the most integral Ganapati manache. Built in the early 1630’s by Shivaji Maharaj and Jijabai Bhosale, the Kasba leads the immersion ritual of Ganesha statues on the 10th day. The mandals in all other temples follow with offering their idols to the water. Tambdi Jogeshwari in Budhwar Peth holds the second manache Ganapati in Pune, installed by Tilak. The temple is in honour of the patron deity of Pune, Goddess Durga, built in the traditional Panchayatan style, surrounded by 4 other temples. The immersion of the Ganesha idol is mirrored by its resurrection the following year. The Guruji Talim temple on Laxmi road can be traced back to 1887, when the third manache idol was installed by worshipers of different religions, including Bhiku Shinde and Ustaad Nalban. 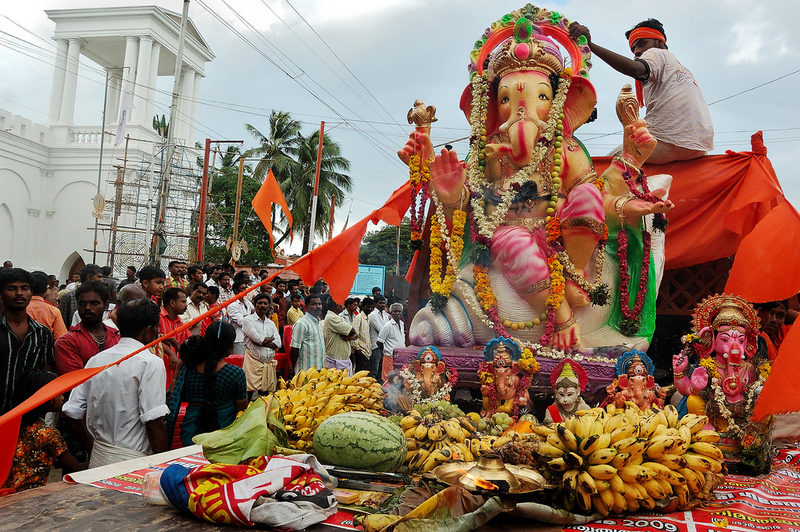 The Talim Ganapati is unique in it’s symbolism of Hindu- Muslim unity. In keeping with this tradition, volunteers from different castes and religions come together and present new decorations for the mandal each year. Before the Ganapti idol was erected here, the Talim, known to be the largest in the area, hosted many wrestlers. 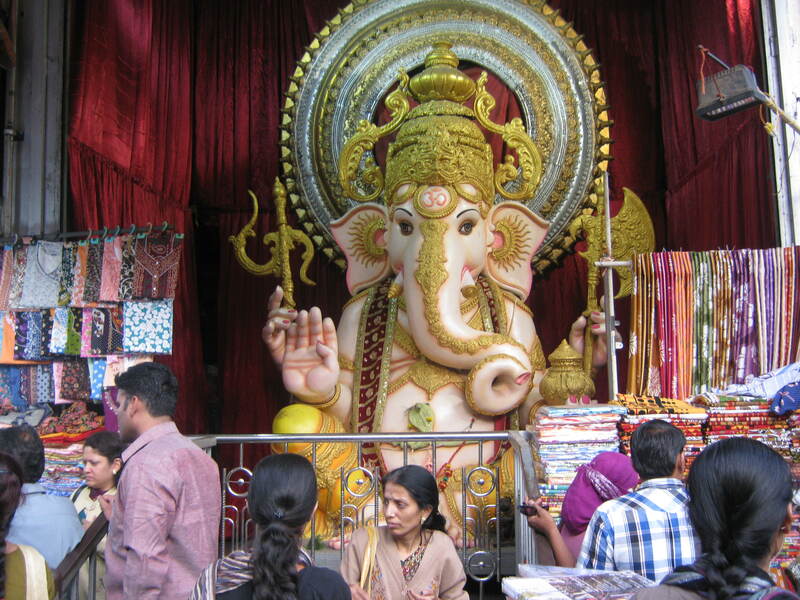 The fourth manache Ganapati of Pune is in Tulshibaug, established in 1901. Built in 1975, the Tulshibaug mandal holds a 13 feet glass fiber statue, and is adorned with ornaments that weigh more than 80 kgs. 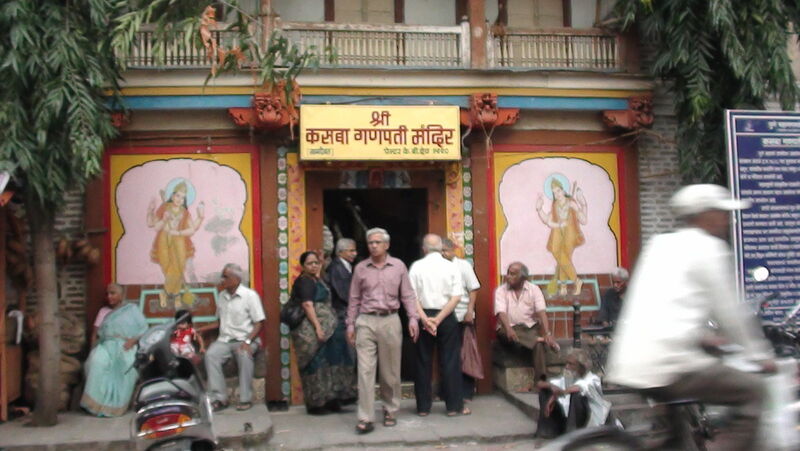 Located in Narayan Peth and built by Balgangadhar Tilak in 1894, Kesariwada Ganapati is Pune’s fifth manache Ganapati. Aside from Vinayaka Chaturthi decorations and festivities, the Kesari Trust spends more on organising various community events, such as competitions and lectures. One can also visit Pune’s well kept secret, the gorgeous ruins of Lord Shiva’s Pataleshwa cave temple. The entirety of the temple is carved out of a single rock, and the pillars and walls carry thousands of beautifully crafted idols. The city of Pune forms the centre of the ‘Ashtavinayaka’ yatra (journey). Ashtavinayaka literally translates into ‘Eight Ganeshas’ from Sanskrit, evoking the pilgrimage to the eight temples in Maharashtra. built to honour Lord Ganesha. Most of these temples are built around water bodies. This has beautifully blurred the boundaries between man and nature. 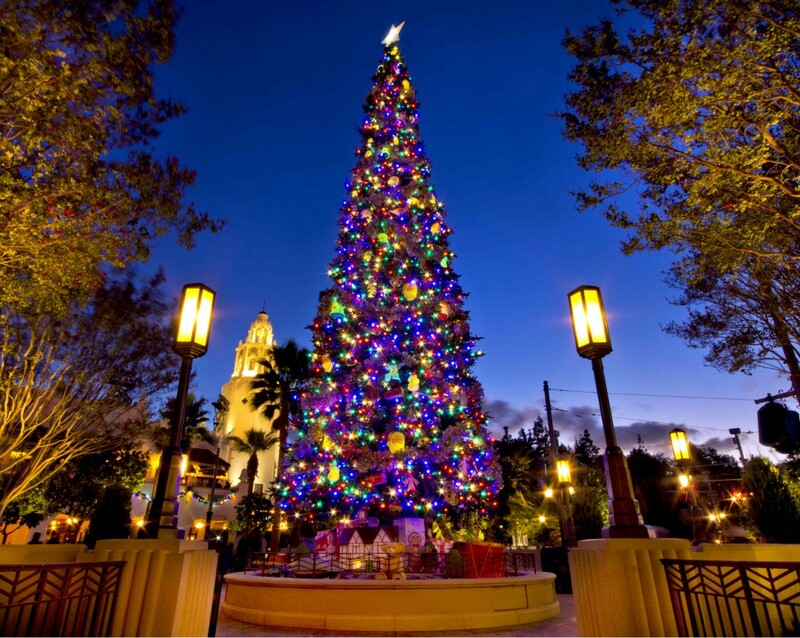 The most convenient way of completing your religious circuit in Pune is to rent a car. Visit the manaches and gather the blessings of Lord Ganesha.